When you login you will be redirected to your dashboard. This is where you will see all the pages that you have connected. Clicking on the green "Get Started" button to go to your bot settings. 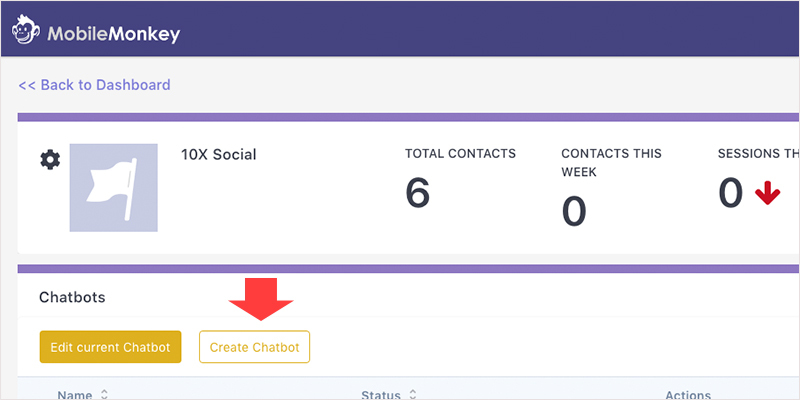 From this page you can edit your existing Chatbot or create a new one. You can also click on the gear icon next to the profile image to refresh your Facebook connection or disconnect the page. Choose a Facebook page. Remember, you can only connect one bot to a Facebook page at a time. 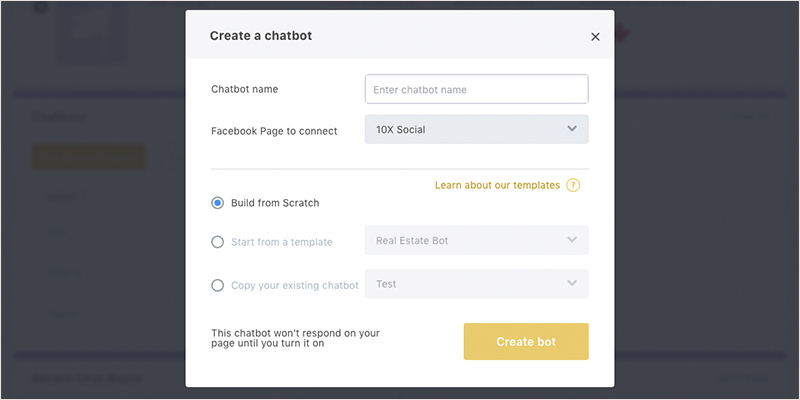 Choose to start from scratch, choose a template or copy an existing bot. Finally "click" the "Create Bot" button. This is the side panel where you can access all the features of your bot. Yours may look different if you don't have a Pro account. Here is your three main pages. The Welcome page, Default page and Main Menu. These are your groups. 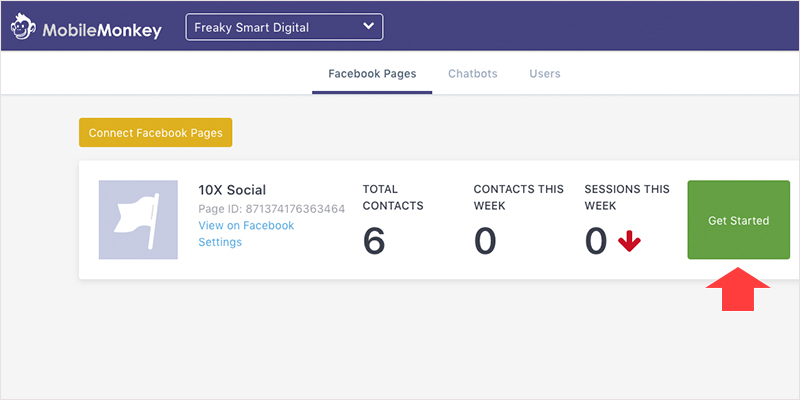 We suggest create groups for each page or pages of your bot. This keeps things organized. These are your pages. You can create as many pages as you want and drag them in the order you want. Simply click "Create Page" to create a new one. This is where you access all your widgets. Clicking on any of the buttons adds that widget to the bottom of the center page. You can then drag it in any order that you want it. This is an image widget. Just clicking on the widget will allow you to add, change or remove the image. This is the Typing widget. This is a very popular widget that helps slow down your flow so it's easier for the user to read. We recommend added this widget between each section. This is the Quick Question widget. 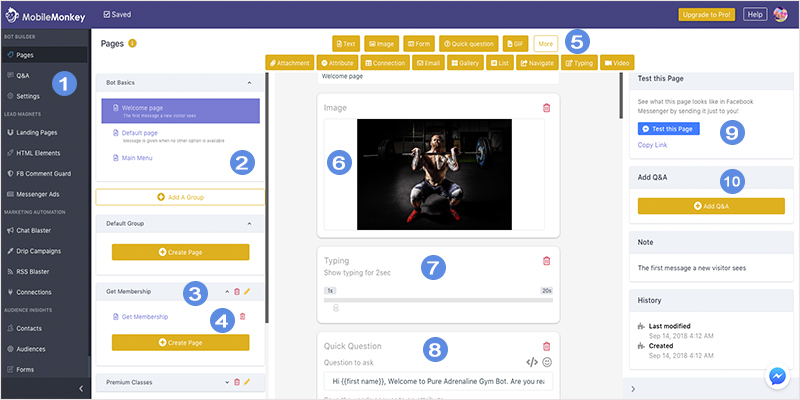 This widget is one of the more used widgets and allows you to ask questions and have the users choose or type in their responses. This widget also captures attributes that you specify for later use in your audiences, drips and blasts. Each page will have this section. You can test your bot or copy the page link to share with someone else. Each page also has this section. This is a list of keywords that you can add to the page so it can be pulled up by typing in that keyword.